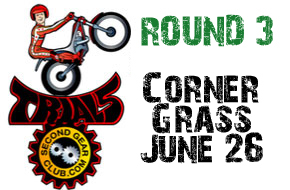 With the rescheduled May 15th Round (now Aug.14) we want to remind you that the third round of the 2011 Observed Trials is at the infamous Corner Grass Track in Compeer Alberta June 26th! Please pre-register to let us know if you are attending! Check the full schedule below. This weekend is great as you get to see some amazing racing on the enduro course as well as party Saturday night! Do not stray too far east as you will cross into Saskatchewan!